San Martino di Castrozza / Passo Rolle - ski resort is situated in a unique natural environment at the foot of the Pale di Martino and offers 44 pistes with a total length of 60 km through the beautiful surroundings of dolomite in altitude from 1404 to 2357 meters. Residence Sporting Club Aparthotel is located directly in the center of San Martino di Castrozza at an altitude of 1467 mA offering spectacular views of the Dolomites. Reconstructed Relais Club Residence lies in the direct center of the center of San Martino di Castrozza at an altitude of 1 467 m.
Residence Sporting Club is located directly in the center of the center of San Martino di Castrozza at an altitude of 1 467 m.
Residence Lastei is located on the outskirts of the center, just a few steps from the center of San Martino di Castrozza at an altitude of 1 467 m.
Tognola - in the mountain ski village of San Martino (1467 m), there are two smaller lifts the red slopes. 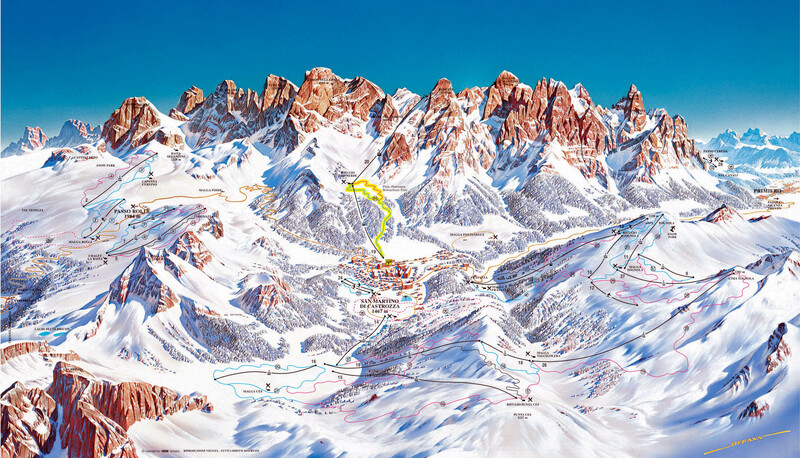 Other ski slopes resemble natural valley, the main part of which is located on the plains of Punta Ces (2,227 m), Cima Tognola (2,383 m), Alpe Tognola (2,220 m), which are interconnected by lifts. Red predominate, but there are also blue lines. Above the valley station in Fratazza come into their own as well as fans of black difficulty. Col Verde - towards a solid shield Pale di San Martino leads from Martina gondola station restaurant Col Verde, where lead down red and blue runs. Further up continues newly built high canopy (40 persons.) To the saddle below the shield Rosetta (2743 m) in Altopiano dello Pale with the possibility of beautiful alpine hikes, ski-touring, freeride. Passo Rolle - really steep mountain road can be reached either by car or shuttle bus from San Martin to Passo Rolle (1984 m). Due to the altitude skiing on natural snow from November to April. Here you will discover the ski area with 4 seats and 2 lifts, 14km of slopes on the beautiful slopes, where they come in all its downhill skiing and snowboarding. The resort hotels will enchant every visitor, even though it is readily available. The road from San Martin to the valley ends in the nearby villages of Val di Fiemme, where it pays to rebound during their stay, at least for a day skiing. Do Bellamonte about 12 km, 21 km Predazzo.